Happy Friday Friends! It's about time you decided to show up around here Friday! I was beginning to believe you didn't even exist! 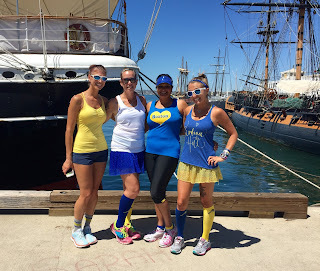 So today's post is exciting because for the first time ever, I am linking up with Marcia's monthly Runfessions and because it is a free Friday Five topic, I am going with 5 Runfessions for your eyes and ears only. Don't tell! 1. I have a run gear addiction! I have more pairs of Pro Compression socks and more Spandits skirts and more Headsweats visors than I know what to do with. But I can't stop. I need more...and more. Every time a new Pro sock comes out, like this one, I have to have it. Or every time Spandits comes out with a new product, like this one, I have to have it! Or especially when Headsweats comes out with a new visor like this one, I HAVE to HAVE it! But isn't admitting you have a problem the first step in recovering from that problem? I know what you are all thinking - this was no secret. We all know this about you! 2. I am not a fan of running while I am running. Running and I have had a tough time since the LA Marathon and if I am being honest, since Revel Canyon City. Maybe I got burned out from running 3 marathons in 12 months but I am having a hard time getting my mojo back. And its not for lack of trying. My girlfriends have been amazing with trying to keep me positive and motivated. Jenny runs with me every week. Jenn joins in. Carlee even came down to Boston Runch with me. Nothing helps. In fact, I just end up feeling guilty when they run with me that I am slowing them down. And they say running is mental. Well, I am not mentally there. And if you have any tips on getting me back, it would help. If it wasn't for my run gear addiction, I don't think I would ever run but I gotta show off those outfits right? 3. For every awesome Instagram picture, there are 45 outtakes. You think I am kidding. Instagram is funny because it captures a moment but what about the 45 moments that aren't posted. One day, I am going to do an entire blog post on just outtakes so you can giggle. For every perfect leap or jump, there is this. A goofy smile, a silly pose. And I thank my awesome friends (Kate, Jenn, Jenny, Vanessa, Jenn, Tara, so many more) for being patient with me while I take pictures while I run. At least that keeps me entertained. There. Can I just say, this post is incredibly soul soothing? I feel so good getting all this off my chest. Some people lose weight and don't eat in times of stress. Not me. I eat. All day. Constantly. Snacks. A snack after a snack. Another reason why I can't stop running. We are in the process of selling our house of the last 6 years and buying a new one. Closer to work. To get rid of the commute so we have more time with the kids. But it is stressful. And the last 4 weeks and the next 4 weeks won't be fun. So, I need to stick to working out and try to remind myself that food doesn't bring comfort. My family and friends do that. If you have any tips for me on this, that would help too! And I don't mean the day I am taking before running Revel Mt. Charleston. I don't mean Memorial Day Monday. I mean the 2 weeks off, sleep in, mind off work and house buying stress, drink in my hand, toes in the sand kind of vacation. The last time I took more than 1 day off from work was last summer. I am ready. My mind needs a break. Maybe that will reset my love of running too. Because when it comes down to it, I love running. I love everything it means. But I just need a break. I love my job too. But I need a break all around. I want to run away with my little family to a deserted island and just spend some QT with them until I get sick of them! Haha! Well, as I said, this was a fun post for me to write because I got to spill my guts. I hope you are okay with that and keep coming back to read what I feel and think. As always, I am linking up with Mar, Courtney and Cynthia - AKA the DC Trifecta, Nicole for Fit & Fashionable Friday and Jill for Fitness, Health & Happiness Link-Up! And as I mentioned, I am also linking up with Marcia for the first time in her Runfessions link up! So please share a runfession with me. Any secrets you want to spill? Thanks for listening! Hang in there, moving is NOT fun, I know...we've done it about 20 times in my lifetime and it never gets easier!! I'm a stress eater as well and it's not the healthy stuff I reach for...hello sugar! I really lost my running MOJO after my last marathon and I don't really feel like I've gotten it back yet, but probably because I keep having crappy runs. Hang in there mama!! I can totally relate to ALL of you runfessions today! I too have a running gear addiction, I've slowed down on the buying but the urge is always there! I too stress eat and desperately need to lose some pounds (its affecting my running). Totally know what you mean about losing your running mojo - that happened to me last year. I think one day I just snapped out of it, but it took a few weeks! I am going on 3 months of no mojo and counting! LOL! We have Spandits to buy! I have a workout clothing addiction! I can't remember the last time I bought "real" clothes! Who needs real clothes! Wish I could wear workout clothes to work! I love your runfessions. 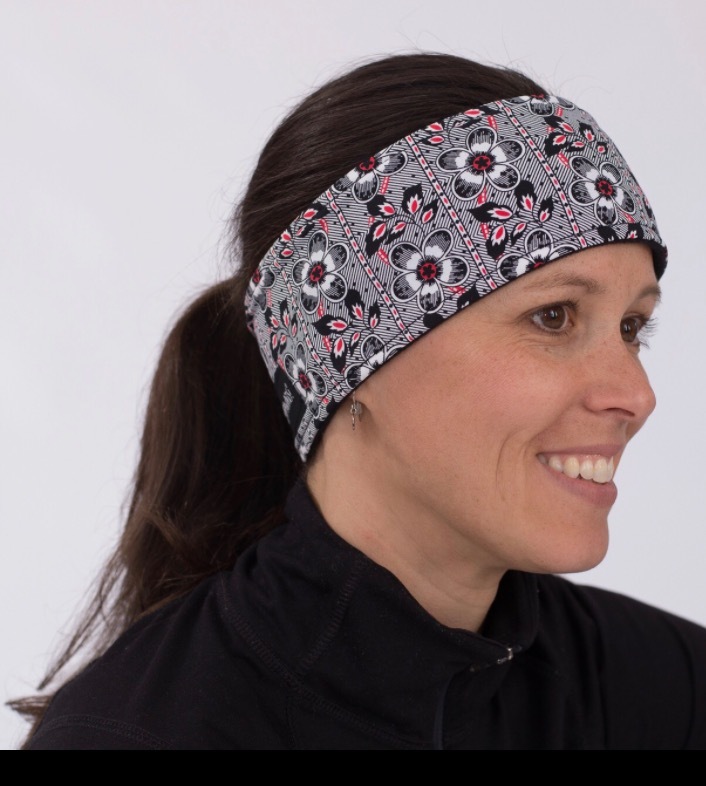 I want one of those Headsweats visors, and totally agree with you on #3-5! Great post!! You will find your mojo! I like you eat all.the.time. And then that starts the guilt cycle of oh lord... I shouldn't have eaten that. I've adopted the I run to eat philosophy. May not be great.. But helps not feel so guilty! I love the out takes post! It takes me several before I post one I like! I hope I do find it...my mojo I mean. And I hope I stop eating ALL THE TIME! I love your collection of visors! I only have 2 but would love to get more! I totally stress eat. I was doing SO well with eating well & dropping a few pounds before OC and the last two weeks just sucked that all to hell. So BLAH for that. I've still lost a few, but definitely lost sight of that goal and feeling kinda icky for it. I can relate. I definitely can relate to the gear. I love all the ProCompression socks, though I've been good about not buying any in a while. BUFF is my Spandits. I want them all. I do stress eat as well. Trying harder on it, but there's those times where I slip up. They do call it comfort food for a reason though. Luckily, there's not a lot to stress eat that's too bad in our house, but out of the house is another story. Unfortunately, I'm not running enough consistently to offset it lately, haha. I am trying to be good! But they have so much cute stuff! #3 - so true! lol. Sometimes I've forgotten to delete the really bad photos and then my husband likes to look through my photos to see what he's missed of our son during the days and he just shakes his head at the million photos or workouts, food and coffee haha! That is funny! My kids love those outtakes! I stress eat, too! And I need a vacation. I love running all the races and my gear addiction ebbs and flows. I wish I had more tips on the stress eating. I will say for the running burn out, take a break and try some other fun classes or something else for a few weeks and come back when you are ready! Let's run away on a vacation together! We should do an outtakes linkup! I always have a ton of them too. They make me laugh! That is GREAT idea! after the move is all done, we should do it! Sounds like it's definitely time for a break. A break works wonders for the body, mind and spirit. We've all been there Smitha. Thanks for sharing with the Fitness Health & Happiness community! I think it is completely normal that there are highs and lows in running.... I am doing 2 marathons this year and I am NOT signing up for a 3rd. So.mentally.taxing. And it is normal you stress eat with everything going on in your life. Be patient. That too shall pass ! A vacation always sound like a really good idea! I hope you find your running mojo again! 3 marathons in 12 months sounds rough! You pick a spot and I will join you on that vacation!